I have reworked my earlier Socialised-Learning Continuum adding in a new starting point, that of an egocentric learner, and a new ideal state of being (not an end point but a state to be achieved) resulting in Liberated Learning, through a Collaborative Group Learning process. Here I channel Paulo Freire, recognising that the purpose of education is individual, and perhaps societal, liberation. I favour the term liberation to that so often cited by Critical Realists, notably Bhaskar, of emancipation. ‘Education either functions as an instrument which is used to facilitate integration of the younger generation into the logic of the present system and bring about conformity or it becomes the practice of freedom, the means by which men and women deal critically and creatively with reality and discover how to participate in the transformation of their world.’ Paulo Freire. Pedagogy of the Oppressed. 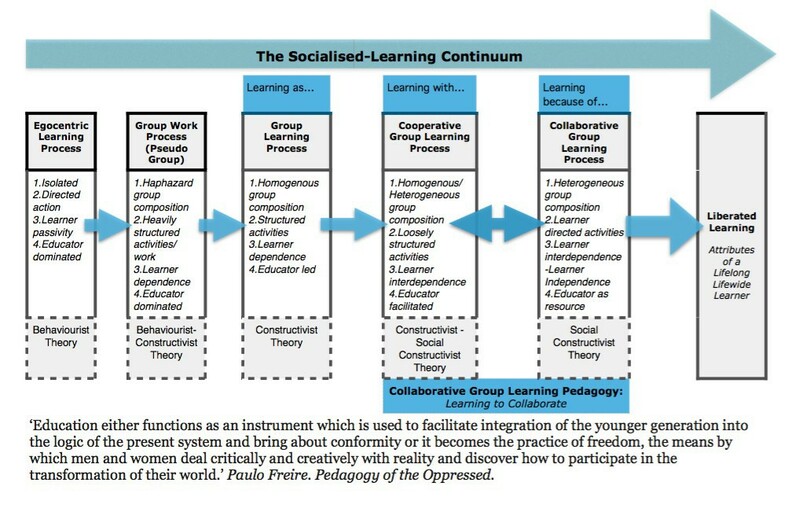 The Continuum helps separate processes of social learning at a theoretical level, moving from an approach towards learning associated with behaviourist writings, through constructivism and ultimately embracing social-construtivism. charting their subtle change across the continuum, in line with the influencing theory of learning, as a means of providing simple principles that could guide the engineering and facilitation of learning applicable at that Process stage. I have also indicated, to aid simplification and application, where Learning as, with and because of the group is located, recognising in itself that moving from the as to the because is a central process within a conscious approach to using a group to facilitate and enhance the process of learning. A bi-directional relationship is highlighted between the Cooperative Group Leaning Process and the Collaborative Group Learning Process as learning through cooperation enables a movement into learning through collaboration, but at times, attempts to learn through collaboration may ‘fail’ and slip back to a state of cooperation. Indeed this is expected during the years of education where we would see individuals learning to learn collaboratively, exercising the skills of and partaking in the process of collaboration. An important role is to be played by the educator here, especially around issues of direction and its associated power status. These last two points, years of education and a relationship with coop-collab learning, and the role of the teacher in all this, will be themes in upcoming posts. It is the engineering and facilitation of these processes of cooperation and collaboration that the main theme of my work, Collaborative Group Learning Pedagogy, concerns itself. As ever I am keen to here the views of anyone interested in the themes of this post.